A dental crown is a laboratory made tooth that covers over your prepared tooth. It helps to reduce the chances of a heavily filled or weak tooth from fracturing during mastication. Because a dental crown covers over all filling and weak tooth structure, there is no chance for the tooth to flex under load, therefore reducing the chances of a filling or tooth breaking over time. In affect, crowns add strength, durability and stability. A dental crown is made of either a precious metal covered in porcelain (porcelain fused to metal crown), gold or all porcelain. Crowns are also used to attach bridges, and to cover implants. They can also have an aesthetic use to cover stained or chipped teeth. Full porcelain lab made crown. If you are missing one or several teeth a dental bridge is an alternative to a partial dentures. A dental bridge is usually defined as a laboratory made fixed prosthesis which incorporates 2 crowns supported by 2 natural teeth (abutments) either side of a gap, with a fake tooth (pontic) joined in between the two crowns. Bridges can replace 1 or more missing teeth, however the longer the span or larger the bridge, the weaker it is as more pressure is placed on the 2 abutment teeth. 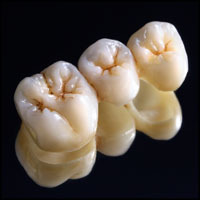 For dental bridges to be strong and reliable the abutment teeth must be solid, with plenty of tooth and boney support. A combination of porcelain and gold alloy materials are usually used to make a bridge. Having a custom bridge can serve 4 main functions. Q. 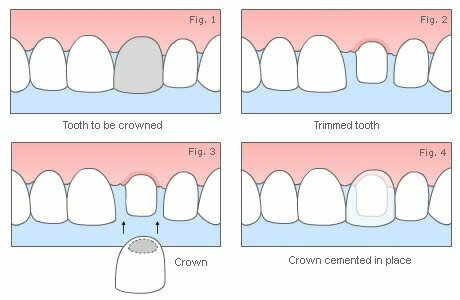 When is a dental crown indicated? Existing large fillings and extensive tooth decay can weaken teeth to the point where cracking can occur, which can lead to a more serious fracture. While broken teeth can sometimes be temporarily patched up with a simple composite resin filling, ideally a stronger material needs to be considered to replace the lost tooth structure and prevent further extensive cracking. More extensive fractures can approach the nerve resulting in a lot of pain to the patient, which then requires root canal therapy to save the tooth. Unfortunately some fractures can extend right down into the root and no option of a filling or even root canal therapy can then save the tooth. This also causes a lot of pain and the tooth will require extraction. A simple crown could have prevented this tooth loss if it had been placed earlier. Q. What is the difference between porcelain fused to metal crowns (PFM), gold and all porcelain crowns? PFM crowns have an inner metal core and an outer porcelain layer which are fused together. The metal component gives the dental crown great strength while the porcelain component gives the crown great aesthetics. PFM crowns are especially useful in masking severely stained teeth. Gold crowns are made of gold alloy. They are considered the gold standard as they are inert and extremely difficult to break. Because gold can be made very thin, less tooth needs to be removed during a crown preparation. The only disadvantage is its gold colour. All porcelain crowns are the most aesthetic. At Just Dental Care we use a laboratory that creates all porcelain crowns out of Zirconia. 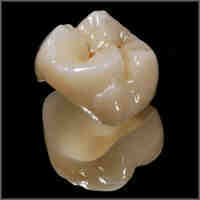 Zirconia crowns are an extremely hard material and also very fracture resistant. Q. How many appointments do I need to have a dental crown? Generally 2 appointments are required. One appointment to prepare your tooth, after which an impression is taken and then this impression is sent to the technician for crown fabrication. In the interim a temporary crown is placed to protect your tooth. The second appointment is usually after another 5-10 working days where the crown is permanently cemented in place. Q. What is a temporary crown? A temporary dental crown or bridge is a temporary cap over the prepared tooth or teeth and it may look and feel like your original tooth. It is placed to protect your teeth and gum tissues while a custom permanent restoration is being created for you in a dental laboratory. In addition, this temporary crown or bridge will help prevent the adjacent teeth from shifting, ensuring that your final crown or bridge will fit. Temporary cement will be used to hold the restoration in place. Q. Where are our crowns made? All our crowns are Aussie made, and we are proud to support Australian companies. The laboratory we use is Sunshine Coast Dental Laboratory on the Sunshine Coast.